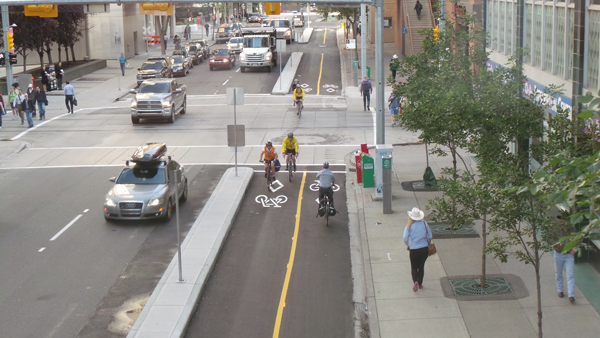 City Council recently approved a Cycle Track Pilot Project Network. 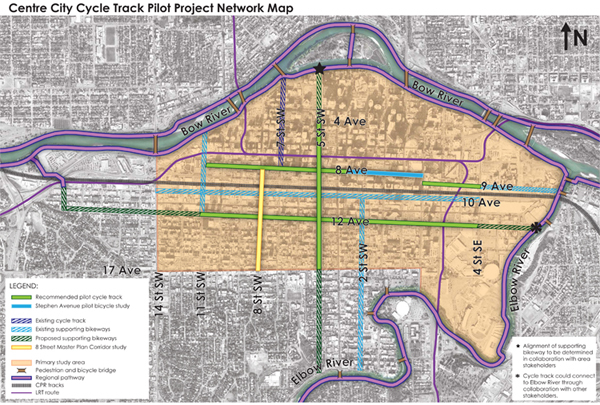 Within the Beltline Communitites, the cycle track network runs east-west along 12 Ave and north-south on 5 Street SW. Cycle tracks, also called 'protected' or 'separated' bike lanes are a kind of infrastructure that physically separates cyclists from vehicles with a concrete divider. A cycle path on the other hand, usually consists of only a painted line and painted cyclist symbols on the pavement. Cycle tracks are safer than cycle paths on roadways because they make driving on roads with cyclists more predictable. They also decrease the likelyhood of cyclists being hit when drivers or passengers open their car doors, called 'dooring'. Separated cycle tracks have also been shown to encourage cycling among people who may otherwise not want to cycle in urban settings because they are uncomfortable riding alongside motor vehicle traffic.